That relaxed pace allows the story to breathe—forget the franticness of most American animation—and along with the gorgeously detailed art, lush color, and swoony music...the film is all but guaranteed to entrance children. 94 min. Walt Disney Pictures. Cast: Amy Poehler, Will Arnett, Carol Burnett. Great things come in small packages. That’s one of the lessons of The Secret World of Arrietty, the entirely charming animated adventure based on Mary Norton’s kid-lit classic The Borrowers. Arrietty is a tale of tiny people warily living underfoot of us towering human “beans” and stealthily “borrowing” only what they need to survive. But it’s also a reminder that the seemingly small package of a hand-drawn animated film remains a warmly welcome alternative to the often cold equivalent of computer-generated imagery. The Secret World of Arrietty hails from Japan’s legendary Studio Ghibli, adopted in the U.S. by Pixar’s chief creative officer John Lasseter. Lasseter has known for years that Studio Ghibli has a license to print magic, making it spiritually akin, though stylistically different, to Pixar. Ghibli’s founder Hayao Miyazaki (Oscar winner Spirited Away) co-wrote with Keiko Niwa the Arrietty screenplay (which has been adapted with care by American screenwriter Karey Kirkpatrick), and supervised the production. Seven-time Oscar winner Gary Rydstrom directs the U.S. version, with dubbing skillfully performed by American actors. Our entry point into the “secret world” of Borrowers is Arrietty (Bridgit Mendler), a plucky, five-inch-tall teen living with her family under the floorboards of a house in the country. Her stoic father Pod (Will Arnett) and fretful mother Homily (Amy Poehler) proceed with care, lest they be picked off by the house cat or discovered by humans and forced to flee. But sickly human teen Shawn (David Henrie), newly arrived at the house to convalesce, doesn’t seem very threatening. He’s almost preternaturally attuned to the movements of the Borrowers, repeatedly spotting Arrietty, but all the lonely boy wants is to win the wary girl’s friendship. Unfortunately, housekeeper Hara (a delightful Carol Burnett) gets the Borrowers’ scent and begins a pitiless campaign of pest control. Director Hiromasa Yonebayashi takes the story at a leisurely pace in the gentle and genteel style familiar to Ghibli fans. That relaxed pace allows the story to breathe—forget the franticness of most American animation—and along with the gorgeously detailed art, lush color, and swoony music (by Cécile Corbel), the film is all but guaranteed to entrance children (those at a preview screening weren’t the least bit squirrely, which is unusual). The Ghibli style, emphasizing meticulous design, perfectly lends itself to the source material. Great care is given to the world the Borrowers have built for themselves in the hidden spaces of the human house, with well-placed nails serving as bridges and ladders; Yonebayashi gives equal attention to the behavior of the usual (water, say) at an unusually tiny scale, or the primordially calming rustle of wind through trees and grass. 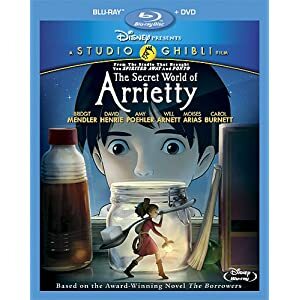 Everything about The Secret World of Arrietty is as vivid as it is (deceptively) simple, which places it in the top ranks of animated movies. With exquisite tenderness, the story brushes against big fears—Shawn grapples with mortality, Arrietty with losing her home—while retaining the optimistic view that friendship can mean mutually solving, or at least alleviating, problems. Kids will love the film because they cannot help but intuit its artistic purity and authenticity. Disney delivers the beautiful The Secret World of Arietty in a likewise attractive special edition Blu-ray + DVD combo pack. The hi-def transfer here is positively top-notch. Even in hi-def, animation can suffer from distracting banding, and hand-drawn animation can succumb to aliasing or "jaggies," but the picture here has no such issues; rather, it's a feast of rich color and sharp detail with a hint of film grain "keeping it real." Because this is a Disney-distributed Studio Ghibli title, we get two equally impressive DTS-HD Master Audio 5.1 surround mixes, one in Japanese and one an English dub. As usual, the English track achieves elegant results, benefitting from professional performances and never seeming like a second-best translation; still, purists will prefer the original track. Both offer razor-sharp detail and full-bodied music, with immersive ambient effects and dialogue that's well-prioritized and clear. The Blu-ray includes the customary Studio Ghibli feature of "Original Japanese Storyboards" (HD) presented concurrently with the film. Also on hand are music videos for Cecile Corbel's "Arrietty's Song" and Bridgit Mendler's "Summertime," a two-minute featurette on "The Making of 'Summertime'" (HD), and a fourteen-minute suite of "Trailers & TV Spots" (HD). Unfortunately, the hour-plus of crew and cast interviews included on Studio Canal's UK release don't make it onto the US release. Still, this combo pack proves highly appealing for families seeking quality children's entertainment. All site content © 2000-2019 Peter Canavese. Page generated at 04/24/2019 05:37:19PM.